Market Outlook - August 2017 | Rocco & Associates Wealth Management, Inc.
Summer is in full swing, which means the days are longer, the weather is warmer, and the second quarter of the fiscal year is over. Looking back on the first half of the year, the major market indices, including the Dow Jones industrial average, the S&P 500, and the Nasdaq composite, have performed well. Overall, the major indices reflect $4 trillion in gains since the election. With performance this strong, it is possible that we have seen the major market indices’ gains for 2017. The current environment in Washington D.C. and the tension overseas regarding Russia and North Korea may slow the S&P 500 in the second half of the year. Entering the second half of the year, we will continue to exercise caution. 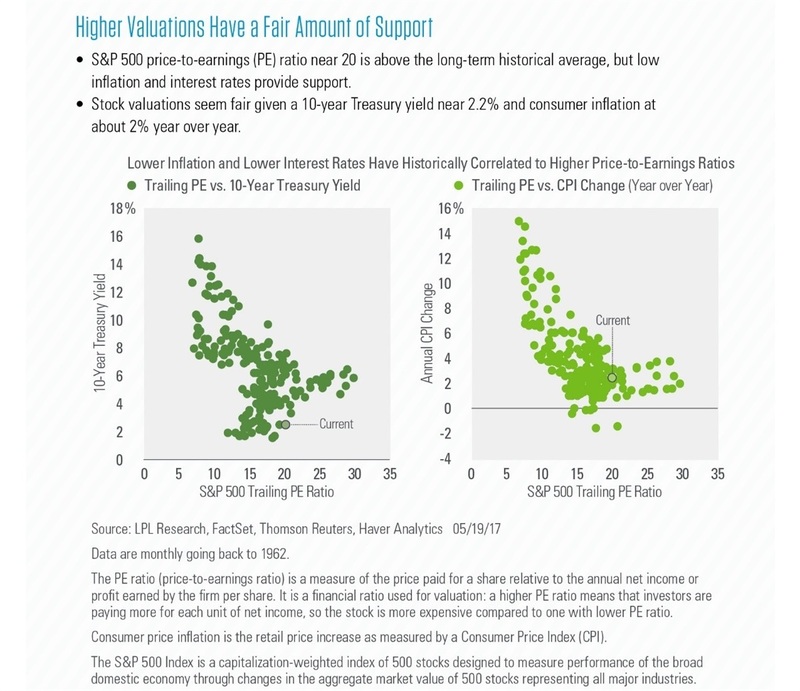 Despite the widespread prediction that overall performance would drop following the election last November, the major market indices have experienced strong gains in 2017. The Nasdaq composite has risen 18% over the past 8 months, with similar gains reflected in the Dow Jones industrial average and the S&P 500. However, we feel that this growth is not sustainable. With Congress at a standstill, it appears that no fiscal policy will be coming out of Washington D.C. in the near future. Thus we must continue to rely on monetary policy to spur growth. The Federal Reserve has expressed plans to raise long-term interest rates. The graphs below express the historical correlation between interest rates and the S&P 500. The current correlation, indicated on the graph below, support our position that we are coming towards the end of the current market cycle. Pressure from overseas may also impact the performance of the major indices. Both Russia and North Korea present potential threats to the current stability. In previous blogs, we have mentioned instability in Europe as well. 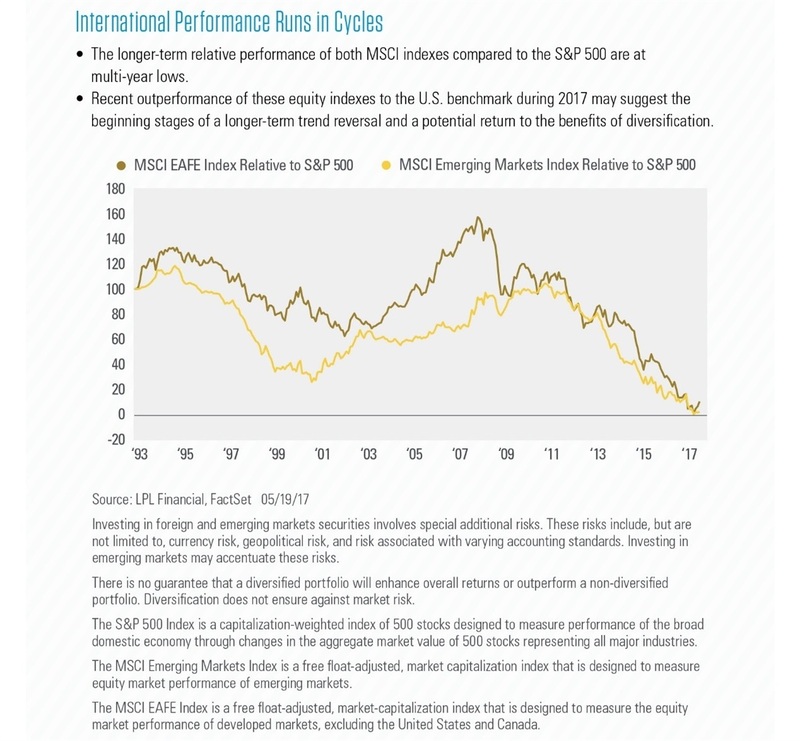 Despite this, mid-year performance shows that international indexes are outperforming the S&P, shown in the graph below. We will continue to monitor the environment in D.C. as well as events overseas, and how the major indices respond. Furthermore, we will remain cautious as we enter the second half of the fiscal year. Your team at Rocco & Associates would like to remind you that your plan takes these various factors into account. As always, if you have any questions or concerns, or you would like to review your plan in more detail, don’t hesitate to reach out!